There are several hidden files and folders in In Symbian and Java Nokia phones . We usually need to access these files to remove /edit /perform different hacks . We do this for removing viruses,deleting unwanted files , hiding certain folders , making Symbian application signed , updating antivirus database etc . So if you want access interior files and folders of a mobile phone , you need a file explorer/browser.Y browser is one such free file explorer/browser for s60V3 Symbian Nokia smartphones .Download Y browser file explorer . As you can see in the above screenshot , each and every file disk of a Symbian mobile phone can be accessed from phone it self . 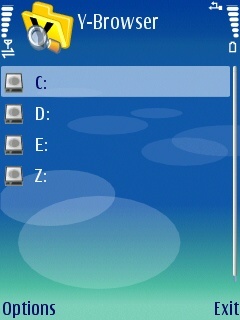 Open internal files and folders of Symbain Nokia ,SonyErisson phones . Get the properties of individual files . Open files with a specified application. Send files over Bluetooth ,MMS and WiFi . Cut ,Edit ,delete ,transfer ,Copy and modify files and folders . Y browser file explorer supported Nokia phones. Y browser file explorer supported SonyEricsson phones. Download Y browser , free file browser application for Nokia.